Mozzarella has a milky sweetness that we know is great on pizza and in a tomato salad. But what else? Here, eight ways to use mozzarella. Upgrade your mozzarella sticks and mix mozzarella with herbed mashed potatoes; coat with bread crumbs and fry until crisp. Comfort food at its best. How do you make a vegetable risotto more decadent? You got it, top it with a slice of mozzarella just before serving. Yep, another way to fry mozzarella. 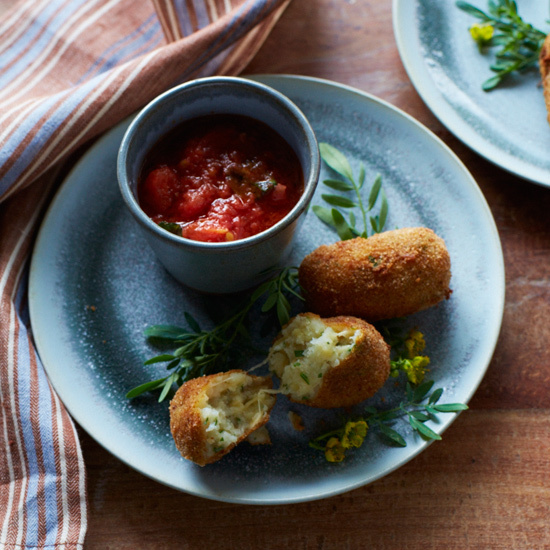 Take your leftover risotto, form into balls around a bite of mozzarella and fry. Molten pockets of goodness. Poke cubes of mozzarella into a frittata just before slipping it into the oven. The result: Pizza for the low-carb set. Mozzarella is a great stand-in for many Mexican-style cheeses; use it to top bean enchiladas. Puree fresh buffalo mozzarella with some of its liquid and olive oil to make a spoonable sauce to top vegetables. Stuff the cheese between masa-based pancakes and griddle to make mini versions of this South American street snack. Feeling ambitious? Re-create the best-ever food scene from the movie Big Night and make this baked pasta with a whopping pound of mozzarella encased in a buttery crust.